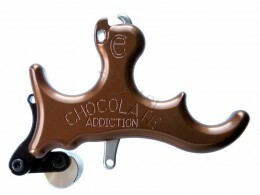 The Chocolate Addiction is one of Carter's most adjustable releases. At the base of the trigger lever are three holes. The first one adjusts trigger travel while the other two are spring-loaded to affect trigger tension. The tension and travel setting options are endless. The cocking lever on the back closes the hook with one motion. Place hook on release rope or D-loop, and push cocking lever.